please contact Neal Spaulding at soolrecordings@gmail.com. In 1984, an NYU student returned home and passed his friend, future Boston producer/musician Pete Weiss, a cassette of an unsigned Poughkeepsie, NY garage-psych-rock band called The Dead Monkeys. After several listens to these raw-yet-beautiful songs the seeds of Weiss’s dream of establishing a recording studio were sown. Ten years later, a connection was made and The Dead Monkeys trekked to Weiss’ then thriving Boston studio Zippah to record 4 tunes, drink some beers and crack each other up. The recordings were put on the back burner when Dead Monkeys’ drummer Ken O’Keefe moved to Japan, guitarist Neal Spaulding to Chapel Hill, NC and bassist Kevin Quinn to Vermont. The dream was over, temporarily. 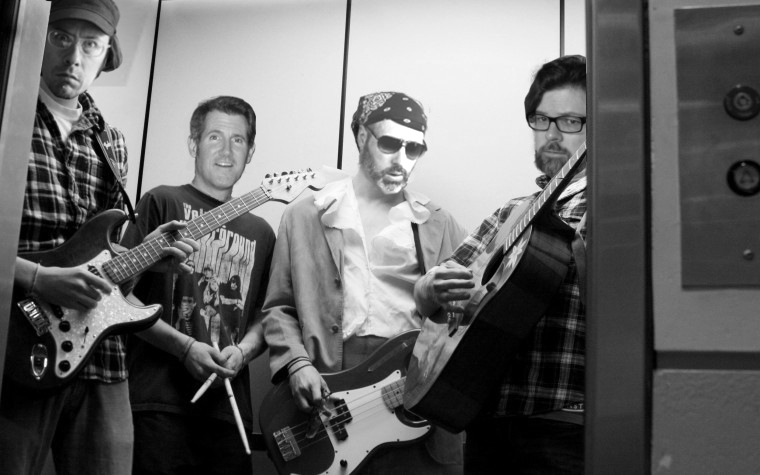 As fate would have it, in 1997, Quinn moved to Massachusetts at a time when Weiss was hatching the concept of an all instrumental band in the style of The Ventures. Quinn and Weiss eventually joined forces in what would become one of Boston’s top instrumental acts, The Weisstronauts. When Spaulding also uprooted and made New England his home, the three made a pact to regularly convene for creative recording sessions, thus giving birth to the genre-traversing loony bin known as Sool. Several CD releases later both Sool and The Weisstronauts are still going strong and this summer with the brief return visit from O’Keefe, still making Japan his home, The Dead Monkeys are looking to resurrect. For Pete Weiss, the opportunity to join his childhood heroes for the first time in a live environment was gift. “Yeah, they were desperate for a guitarist/keyboardist who knew the tunes so I said, uh, sool, er, I mean cool, I guess I can do it.” In their short string of shows the from August 8-11 the band will play a couple of in-store gigs promoting new releases by The Dead Monkeys and Sool along with club gigs in New Paltz, NY, Ithaca, NY and Boston, MA. The shows will feature tunes from The Dead Monkeys, Sool, some Weisstronauts instrumentals and even an array of cover tunes. In Ithaca, Sool will have the opportunity to promote their recent collaboration with Inverse Room (the musical alter ego of Ithaca-based novelist J. Robert Lennon) who will join the band on stage to perform songs from the new EP “Sool & Inverse Room Present a Problem”. Bring your sense of humor and love of folk, pop, rock and twang. 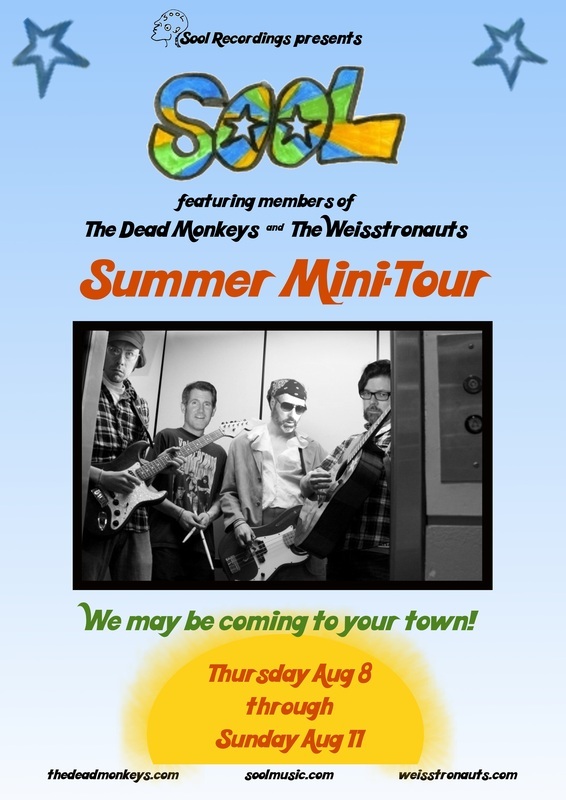 The Dead Monkeys are back, and Sool and The Weisstronauts are still here! Somehow, all is right in the world of old Memorex cassette recordings from the 1980’s. Fri Aug 9 (10 PM) Lot 10 in Ithaca, NY with Ithaca favorites The Fly Rods and The Rungs!